PORTLAND, Maine (AP) -- Last year's eel fishing season started strongly when prices rocketed above $2,000 a pound. High prices are again expected when the 2013 season kicks off Friday. Prices won't be set until the catch gets under way, but eel dealers say there's little doubt that they'll be high. "If the catches are great, the prices will go lower. If the catches are poor, the prices will go higher," said Mitchell Feigenbaum, owner of Delaware Valley Fish Co., which buys eels in Portland and ships them to China. "There's still ample demand for the product worldwide." The price that fishermen get for their eels has fluctuated wildly through the years, but spiked two years ago due to an eel shortage from Japan and export restrictions in Europe. Last year the price reached unprecedented levels. When all was said and done, they were worth $38 million — an average of just under $2,000 a pound — to fishermen, making it the state's second-most-valuable fishery behind lobster in 2012. 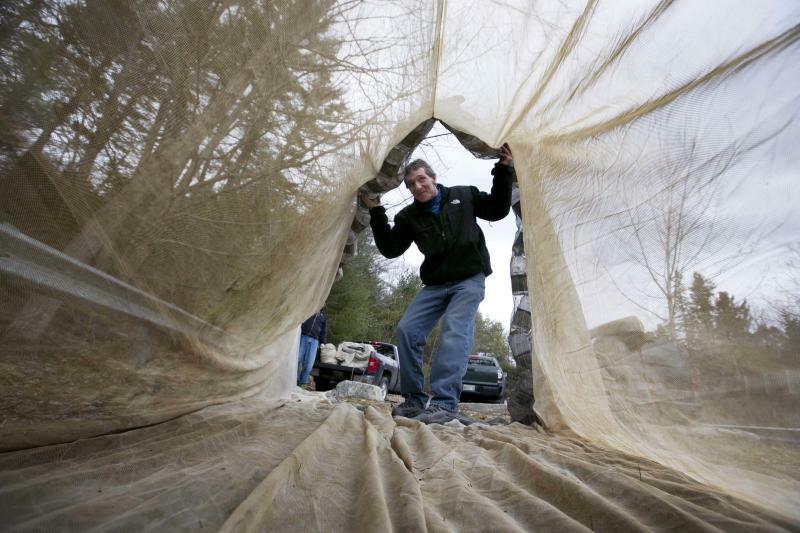 The state has issued 413 licenses to fishermen who stake out spots along Maine's coastal rivers and streams, where they catch the eels in fine-mesh nets as they swim upstream during the 10-week season, which ends May 31. Besides the licenses issued by the state, the Passamaquoddy tribe issued another 237 licenses to tribal members last year, up from two the previous year. The tribe issued the licenses when the prices shot up, arguing they were entitled to fish what they wanted because state law didn't put any limit on tribal licenses. Tim LaRochelle, a harvester and eel buyer from Woolwich, and two of his fishermen friends parked their vehicles in a lot along a river outside of Portland on Thursday in preparation for the season ahead. They'll work the river in the weeks ahead, sleep in their vehicles and won't leave until the season is over, he said. He first fished for eels in the mid-1990s and recalls years when he was getting under $30 a pound. Fishermen typically haul in about two pounds per day. In years past, nobody ever thought prices would go as high as they have, he said. There were reports of fishermen making $10,000 to $20,000 a day last year. But he's thankful there's a strong appetite for eel dishes such as kabayaki in Asia. "Somebody said they eat eels like we eat hamburgers," he said. With elvers worth so much last year, law enforcement officials issued 300 summonses and another 98 warnings for elver violations, mostly for fishing without a license. Marine Patrol Maj. Alan Talbot said this year could also be a busy one for his officers. "We've heard the price is still going to be very high," Talbot said. "I've heard anywhere between $2,000 and $3,000, but who knows. It's hard to tell until the season starts." State officials have expressed concerns over how many licenses the Passamaquoddy tribe might issue this year, said Rep. Walter Kumiega, co-chairman of the Legislature's marine resources committee. Officials want to issue enough licenses to allow fishermen to reap benefits, but not so many that the state is in violation of federal fishing regulations, he said. There is no cap on how many licenses the tribe can issue, but the Marine Resources Committee last week endorsed an emergency bill that would limit the tribe to 200 licenses, while giving the Houlton Band of Maliseets tribe 16 licenses and allowing for another 25 nontribal licenses. The full Legislature is expected to vote on the bill this week. Another concern is a recent stock assessment of American eels that concluded that the eel population is technically depleted in U.S. waters. The population along the eastern seaboard is at or near historically low levels due to a combination of overfishing, habitat loss, predation, environmental changes, disease, toxins and contaminants, food web alterations and turbine mortality, according to the Atlantic States Marine Fisheries Commission, which is based in Virginia and regulates the eel fishery. As a result of the stock assessment, an ASMFC eel management board has drafted a proposal looking at potential new management measures for glass eels — the type harvested in Maine — as well as silver and yellow eels, said Kate Taylor of the ASMFC. Management options include quotas, gear restrictions, seasonal closures or closing the fishery, she said. Glass, yellow and silver eels are all the same eel, but at different life stages. Glass eel harvesting is prohibited in all states except Maine and South Carolina, and only Maine has a significant catch. Yellow eels, and silver eels to a lesser extent, are harvested commercially in several states, primarily for food and for bait for recreational fishermen. The U.S. Fish and Wildlife Service has also been petitioned to review whether eels should be listed as threatened or endangered under the Endangered Species Act. A 2007 review found that federal protection wasn't warranted.